Summertime is here and the sun has been harsher than ever. Wondering how to keep your skin protected? Having the best sunscreen lotion is a good option to keep your skin protected from sunburns which can be quite painful leading to skin problems like rashes, itching, hives, and even skin cancer in extreme cases. Besides, Most sunscreens today contain ingredients that can prevent premature skin aging and can also hide any blotches or marks on your skin. Even, it does not matter if you have dry skin, oily skin or sensitive skin, there is something for everyone. But, picking the best one for your skin is something tedious work. So go ahead, read through, and find out some of the best Sunscreen lotion available in India. Pick what suits your skin type the best and say goodbye to sunburns, dryness, fine lines, tan, and wrinkles. Sensitive skin gets easily irritated when out in the sun. It is either prone to sunburns or acne. Therefore, sunscreen for sensitive skin must be cooling and soothing in nature. Don’t let sensitive skin become the reason for not using a good sunscreen lotion. 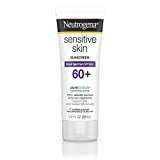 Neutrogena Sensitive Skin Sunblock Lotion, SPF 60 offers wide-spectrum sun protection from UVA and UVB rays. It is completely paraben free that can irritate sensitive skin and cause any allergy. Even it is specially formulated to spread evenly on your skin and leave it feeling supple. All this make this a ideal sunscreen lotion for the people with sensitive skin or those who spend long hours in the sun. SPF 60 offers wide-spectrum sun protection from UVA and UVB rays. Completely paraben free, which make it safe for your skin without the fear of carcinogenic chemicals. Completely oil free, therefore great for use during sultry and humid weather to prevent unwanted oily sheen on the skin. Free from fragrance which makes it perfect for sensitive skin. Hypoallergenic to prevent any rashes or skin irritation. Water resistant for upto 80 minutes after application. Although it has no oils, the thick cream is heavy and greasy when applied. Tends to leave a white layer on the skin after application. 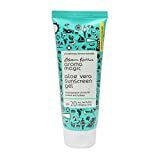 Even though this sunscreen has a low SPF of 20, this product offers multiple benefits, that make it a great sunscreen for people with acne or allergy prone, sensitive skin. This is a mild, gel based sunscreen that has been specially formulated to suit sensitive skin. It gives your skin a completely invisible finish and leaves it feeling natural, smooth, and soft. 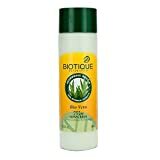 As it contains cucumber extracts this sunscreen is very light and soothing on the skin and works as a great detan agent as well. It keeps the skin hydrated and keeps acne at bay. SPF 20 gives you the sun protection that you need while keeping your skin free from any allergic reactions. It comes enriched with the goodness of cucumber extracts that provide relief from sunburns. Being gel based it is light and perfect for skin that is acne prone. The special formula makes it hydrating for the skin as well and after using it you need not apply any additional moisturizer. The sun protection provided is moderate. Reapplication is necessary as the product does not stay on the skin for too long. If you have dry skin, opt for a sunscreen lotion that moisturize your skin as well. You must look for a product that keeps your skin hydrated for long and keeps it from drying even after long hours of sun exposure. This is one of the best products available right now. It is light, easy to apply, and is absorbed instantly by the skin. Instant absorption makes it a suitable product for dry skins as it helps nourish them from within. Along with that, SPF 50 ensures that your skin gets extra protection every time you step out into the sun. It protects the skin from both UVA and UVB Rays. It is known to prevent darkness of the skin, pigmentation, and dark spots. This product is hypoallergenic and is non-comedogenic, which makes it safe to use on most skin types. It works as a great makeup base and moisturizer as well. It may leave white layer on the skin after application. The product is more expensive than other products. This sunscreen has been given 5-star Boots Rating for best protection against tanning and ageing due to sun exposure. It also features a special formulation that ensures day long moisture lock, keeping the skin hydrated and supple even after long hours of application. Offers broad spectrum UVA UVB protection. It is a light textured cream that absorbs well immediately. Nourishes the skin for long and locks in moisture. Gives great results within seven days of regular use. You do not need extra moisturization with this product. People with acne prone skin must first do a patch test to see results before opting for this cream, although it is dermatologically tested and safe for most. Oily skin tends to become more oily and glossy during summer months. Look for a sunscreen that leaves a mattifying effect. These sunscreen lotions keep the oil-secreting action of sebum glands under check, and keeps it dry even after long hours of application. Lotus Herbals is a great lotion for skins that tend to become greasy too soon and helps to soak up excessive oil, besides offering great sun protection from UVA and UVB rays. It comes with ingredients like comfrey, horse chestnut and vanilla extracts which are very beneficial for the skin. 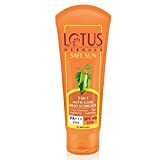 Lotus sunscreen lotion It offers SPF 40 which makes it one of the best options for the Indian weather. Since it gives you a matte finish, it is perfect for oily skin. It offers astringent properties and therefore refines pores and prevents them from clogging. The natural ingredients make it an anti-inflammatory and soothing application in the hot summer months. The scent of the cream is mild and lingers on all day. The thick creamy consistency of the lotion ensures that it stays on the skin for longer. Horse Chestnut might cause allergies in some people. Make sure that you test it on your elbow before using. It is not suitable for application on the whole body. Directions: Apply Lotus Herbals Matte-Look Sun Block liberally and evenly on face and exposed parts of the body (neck, arms, legs, etc.) before exposure to sun. Re-apply frequently. VLCC Matte is a great product that comes enriched with the goodness of pineapple. Its non-sticky formulation ensures that you do not feel uncomfortable and patched up after applying it. It is light and easy to use. Besides, It’s SPF 30, provides full spectrum protection against UVA and UVB rays. The matte finish ensures that your skin does not feel oily and greasy after application. Natural ingredients such as pineapple extracts, almond oil, jojoba oil, sandalwood extracts, and aloe vera extracts among others enhance the quality of the skin, leaving it hydrated without the greasiness. You will have to blend it well into the skin or it may leave a cakey texture on the skin. It is not completely sweat-proof. Usage: Apply liberally on the face & neck, 15-20 minutes before sun exposure. Reapply frequently for long duration sun exposure. This product comes with a unique dry-touch, light, and clean feel formula. It is completely oil free which makes your skin non-sticky. Due to this, it is perfect for use in the hot summers. It is easily absorbed by the skin and leaves it feeling smooth and soft. Along with that, SPF 50 offers best skin protection as well. The product offers broad spectrum sun protection and therefore, keeps the skin safe from both UVA and UVB Rays. It is known to prevent sun burns, skin aging, age spots, and skin darkening. It comes with special Helioplex technology which makes it fully sweatproof and waterproof. As a result the sunscreen does not wash off or get smudged with sweat or during sultry days. It is also non-comedogenic, making it safe for use on all skin types as it does not clog pores and lead to acne on sensitive skins. 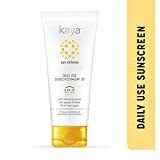 This sunscreen is great for use on both face and the body. You may have to reapply the product a couple of times as it does not stay on the skin for too long. It is more expensive in comparison to the other sunscreens that are available. If you have over sensitive skin that breaks out or is allergic to certain ingredients, it is best to opt for dermatologically tested and recommended medicated sunscreens only. Ayurvedic formulations also work well in this case. 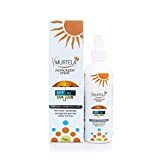 The special oil free formula of Murtela Sunscreen Spray SPF 30+++ offers the best sun protection for your skin. It is made entirely from organic ingredients that have additional benefits for the skin. Known to prevent sunburns and skin aging, this product offers day long protection from the harshest sun. The product is completely hypoallergenic and non-comedogenic making it ideal for all skin types. It is water resistant and therefore does not get washed off easily with sweat. The formula is completely oil free to give you a dry finish after application. You need to apply a generous amount each time to get complete sun protection. Requires re-application after long hours of swimming and about 2-3 hours of sun exposure for best effects. It Is An Encapsulated Organic Sunscreen Spray That Provides Broad Spectrum Protection With Anti-Ageing And Antioxidant Benefits For A Healthy, Nourished And Well Protected Complexion. A Perfect Blend Of Ingredients To Enhance Your Skin's Overall Health. It Offers The Highest Quality Sun Protection In A Unique, Water Resistant, Oil Free Formula.Easy To Use Fine Mist Spray Offers Quick Protection From UVA And UVB Rays. It Forms An Invisible Uniform Layer That Provides Protection Enhancement With Anti-Ageing, Anti-Oxidant And Day Long Cell Hydration. This sun lotion is one of the maximum SPF 75 offering sunscreens that lends wide spectrum sun protection from UVA and UVB rays. Enriched with the goodness of aloevera this sunscreen is very calming and soothing for sensitive skin. Even the aloe vera makes this lotion ideal to use in the hottest and most humid conditions. The lotion enriched with beneficial properties of Sunflower, Safflower, and White Sandalwood. This is an all-natural, ayurvedic product with antiseptic and antibacterial properties, and is therefore great for acne prone skin as well. A high SPF 75 makes this sunscreen perfect for long hours in the sun. It also moisturizes the skin leaving it feeling soft and supple with each application. It is a broad spectrum sunscreen which offers protection against UVA and UVB rays. Natural ingredients also keep the skin safe from pollutants. The lotion may seem too watery in comparison to the regular sunscreens available and might need extra effort to absorb completely. After it dries, it tends to become flakey and leave white patches all over the applied area if not blended well. The smell of the product may not be appealing to everyone. With more of outdoors and exposure to direct sun rays, men in India must invest in sunscreens providing SPF 30 or more. 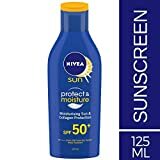 So whether it is a day out on work, time at the beach, or a marathon that you are running, here are some great sunscreens for men that do their job well. Ideal for men’s skin with slight stubble or beard this sunscreen spreads easily and gets absorbed quickly. It comes infused with the goodness of Roman Chamomile and Himalayan lavender essential oils that keep the skin nourished and hydrated. It is a 100 percent natural product that does not contain any synthetic fragrances, mineral oils or paraben. It is non-sticky, non-oily and very light on the skin and allows the skin to breathe. Helps diminish dark spots, fine lines, and age spots when used regularly over time. SPF 40 ++ prevents tanning. Might leave an oily shine after a few hours of application, making it unfit for use on oily skin as it may breakout into pimples and acne. Also, many users find its smell to be a little unpleasant. With SPF 50, this lotion offers great skin protection, particularly for the rugged skin of men. 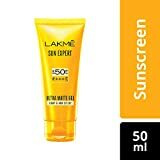 It is ideal for use in the harsh Indian climate as it is one of the lightest sunscreen lotions which leaves the skin feeling plump and well moisturized even after long hours of sun exposure. It is ideal for skin that is normal to dry. It comes with PA ++ and is collagen protecting, which means that it keeps skin looking younger for longer. It is fully sweat and waterproof which means that it lasts longer on the skin. It is completely paraben free. It is not suitable for oily skin as it makes the skin have an oily glow after application. It may cause mild allergies on sensitive skin types. So make sure you conduct an elbow patch test before using this product on the face. Usage: Step 1: Dispense the sun lotion on the palm of your hand, Step 2: Apply evenly all over the body, Step 3: Repeat the process always before stepping out into the sun. The effects of a good sunscreen last for a long time. Make sure that you use it before you head out in the sun. It is recommended that you reapply the sunscreen every two hours, especially if your skin is exposed to the sun for longer durations of time.